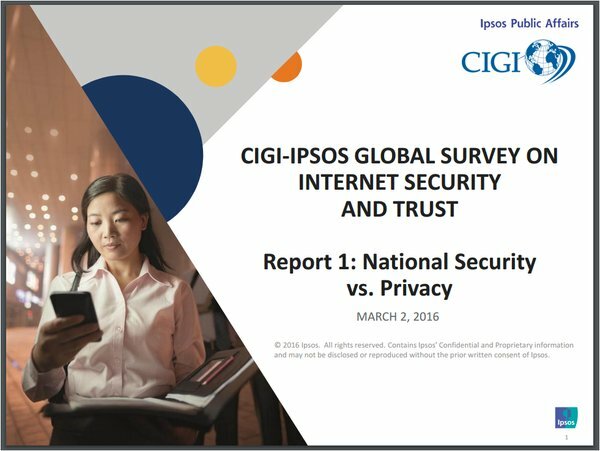 A new global survey by the Centre for International Governance Innovation (CIGI) and conducted by global research company Ipsos records that consumers are increasingly worried about their online privacy and security, especially when it comes to ‎how their personal data is handled by private corporations and governments. The survey across 24 countries finds that a majority of global citizens (83%) believe that there need to be new rules about how companies, governments and other users use personal data. The report was announced at the occasion of the United Nations Conference on Trade & Development E-Commerce Week in Geneva, the 2016 CIGI-Ipsos Global Survey on Internet Security and Trust findings show that a strong majority (85%) also believe that their governments should work closely with other governments and organizations to make the Internet more safe and secure. When asked about online privacy, a majority of global citizens (57%) were more concerned about their online privacy compared to one year ago, with only a minority of global citizens (38%) trusting that their activities on the Internet were not monitored, and similarly less than half of respondents (46%) trusting that their activity online were not being censored. More than just a vibrant symbol of human progress, the Internet, has allowed populations around the world to bridge physical and economic divides, while further permitting unbounded human development and enhanced freedom. However, today there exists unanswered questions about the extent to which global citizens can trust the Internet’s limitless reach, and exactly whose responsibility it is to govern this unchartered space? When it came to perceptions of who global citizens felt they could trust to keep personal information safe and secure, only three in ten (30%) respondents agreed that their own government is currently doing enough to keep personal information secure and safe from private companies, and similarly three in ten (31%) agreed that private companies are doing enough to keep personal information secure and safe from governments. Further than this, most (83%) global citizens appear to have changed their online behaviour in an effort to control the amount of personal information that is being shared online. The behaviour information ranges from minor changes such as avoiding opening emails from unknown email addresses (55%) to more substantial changes such as doing fewer financial transactions (23%), or even using the Internet less often (11%). The survey of 24,143 users, conducted between the dates of November 20 and December 4, 2015, included individuals in the following countries: Australia, Brazil, Canada, China, Egypt, France, Germany, Great Britain, Hong Kong, India, Indonesia, Italy, Japan, Kenya, Mexico, Nigeria, Pakistan, Poland, South Africa, South Korea, Sweden, Tunisia, Turkey and the United States. These statistics are part of the 2016 CIGI-Ipsos Global Survey on Internet Security and Trust, and come at a time when issues of cybersecurity and human rights have taken over debates around Internet security.